C’eravamo prima, ci siamo durante e ci saremo, ovviamente, anche dopo! The Floating Piers, l’installazione dell’artista Christo Vladimirov Javacheff tra Sulzano e Mantisola, è sicuramente un evento di portata mondiale per il nostro territorio, ed anche noi Arcieri del Drago intendiamo celebrarlo al meglio facendo…… quello che abbiamo sempre fatto e che continueremo a fare: mettendoci a disposizione di chiunque volesse trascorrere qualche ora di svago, divertimento e sport sul nostro territorio, mentre è in visita grazie all’evento di Christo! La situazione logistica dell’intero territorio sarà alquanto problematica, ma troveremo sicuramente il modo di rispondere alle richieste di quanti vorranno provare quest’emozione. 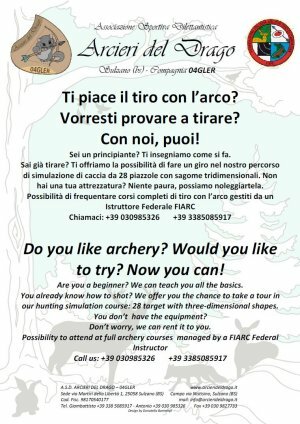 Per avere tutte le informazioni sulle nostre proposte, cliccate sulle immagini seguenti e contattate i numeri telefonici indicati o mandate una mail all’indirizzo info@arcierideldrago.it. We were there before, we are going to be there and, of course, we are going to be there afterwards! The Floating Piers, the temporary monument by artist Christo Vladimirov Javacheff that connects Montisola to Sulzano, is certainly a worldwide event, unique in its kind for our town. 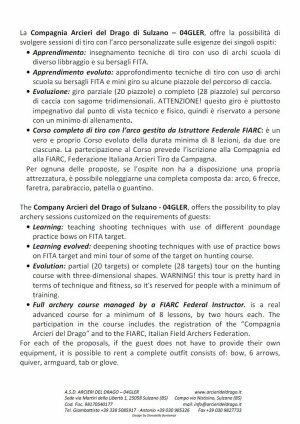 And we, Arcieri del Drago, want to take part to this event by doing… what we have always done and we wish we’ll always do! We will be available for anybody who will stay here for visiting the Floating Piers and wish to spend some time relaxing and sporting! Because of the event, moving around the area will be quite difficult, but we will try our best to accomplish those who wants to try archery. If you need more info, click on the images below, contact us via the phone numbers or via email at info@arcierideldrago.it. You are currently browsing the Arcieri del Drago blog archives for giugno, 2016.